I received two EPs this week, in trade for a copy of my own album. They were Fiona + Sal from 2007, and Black Lips from 2008, both home made affairs by Matt Neyens aka. The Black Lines – because all DIY indie solo-artists need to have a band name that implies that they may be more than just one person. I’m still working my way through both, but it’s proving difficult as I keep returning to the title track from the Black Lips EP, which has gotten me really excited – and it’s been a little while since music has genuinely excited me. I’ve even figured out the chords for the song (or something close to what the chords might be) and written down the lyrics so I can sing and play it myself. It’s a very catchy song about making eye contact with a girl in a library and possibly meeting up in the woods at night with said girl, and Matt’s vocals are superb. My only complaint would be that the drums used sound a bit out of place; some different percussion might have worked better, or perhaps just more guitar with no percussion at all. 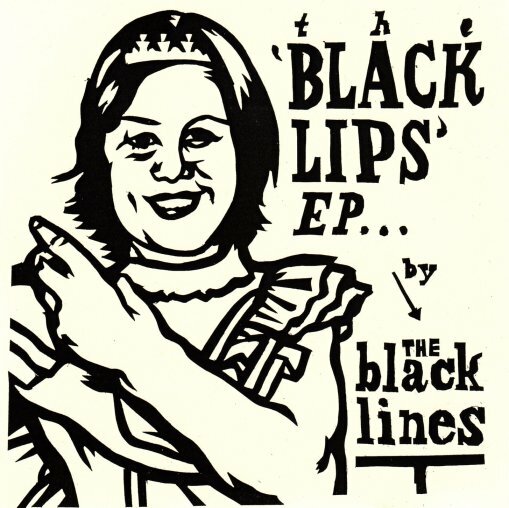 So “Black Lips” from the Black Lips EP by The Black Lines is this week’s pick for Fidelity Wars. If you’re curious about his music and would like to hear more, you can check out his MySpace page. This entry was posted in fidelity wars and tagged black lips, the black lines. Bookmark the permalink. that’s a true story, actually. she always wore black lipstick, but did indeed have a fantastic smile.